Staff at British Transport Police West Yorkshire are backing the ‘Big Thank You’ campaign, by thanking their winter heroes and are encouraging Leeds residents to say thanks to their winter hero. 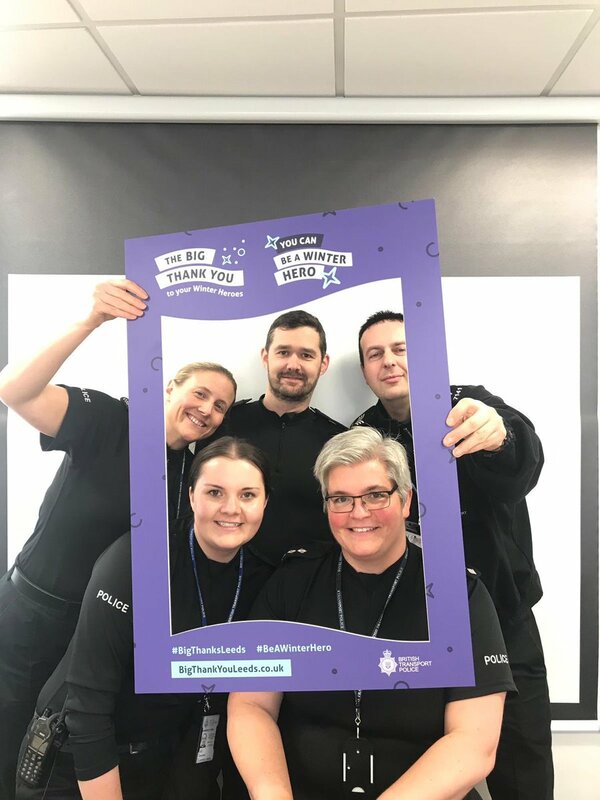 Chief Inspector Lorna McEwan, from British Transport Police West Yorkshire, said: “The Big Thank You campaign is a brilliant opportunity for you to thank your winter hero, someone who has helped you this winter or previous winters. Your winter hero could be your work colleagues, neighbour, family / friend, unpaid carer, local shop or your local community, it could be anyone. As these individuals help people in Leeds to stay well and keep the city going throughout winter. Philomena Corrigan, Chief Executive at NHS Leeds Clinical Commissioning Group, said: “We’re really pleased to have the British Transport Police West Yorkshire supporting the Big Thank You campaign as they have been a key partner in helping to raise the profile of the campaign locally. “You can visit the website and view the Big Thank You gallery to see what individuals and organisations have so far submitted. There are a range of messages to NHS staff, carers, local businesses, GPs and voluntary organisations. We’ve also had messages for our neighbouring trusts, like Bradford Teaching Hospitals NHS Foundation Trust and Harrogate and District NHS Foundation Trust which we have shared with them. The campaign is a partnership approach involving the city’s NHS organisations, Leeds City Council, Yorkshire Ambulance Service NHS Trust, West Yorkshire Police (Leeds District), British Transport Police West Yorkshire and community and voluntary organisations who are recognising the dedication and hard work that staff do every year to help people through winter.